MyIDEAS has recently been improved, this is a good opportunity to show what it can do and how. 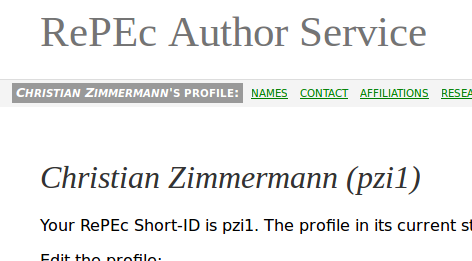 This is a personalized service, thus it required credentials, unlike almost everything else in RePEc. We thus thus start with authentication, then look at how to populate one’s MyIDEAS account and then how to use it. Authentication is done through RePEc OpenID, which means that you need to have an account on the RePEc Author Service (but do not need to be an author) and know your RePEc Short-ID. 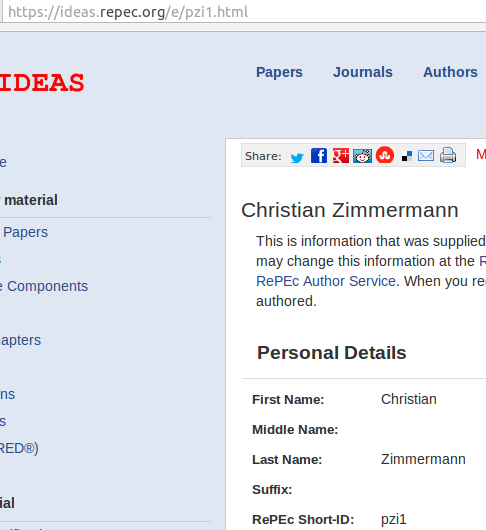 You can find the latter in many ways: in your RePEc Author Service account, on your profile in IDEAS or EconPapers, or by using this look-up tool. See in the images below where the Short-ID pzi1 appears, including the address bar (click on any image to see it larger). To log in, you will find a prompt for MyIDEAS almost everywhere on IDEAS, just below the top bar. Your are now ready. You will be logged out after an hour of inactivity. Go almost anywhere on IDEAS and you will see a button that allows you to save something to your MyIDEAS account. For example, here is a paper abstract page. You have now the option to save this paper, and you can thereby start building a bibliography. We will see later what this looks like in MyIDEAS. If you click on the button, you get a confirmation. You can also follow serials (working paper series, journals, for example), authors and JEL codes. Following means that whenever you go to your MyIDEAS account, you can see what has been added since the last time. You can also follow keyword searches, a new feature. Do a search on IDEAS and add it to you MyIDEAS account. Note that you can refine your search with all the options offered on the advanced search page and they will be saved. 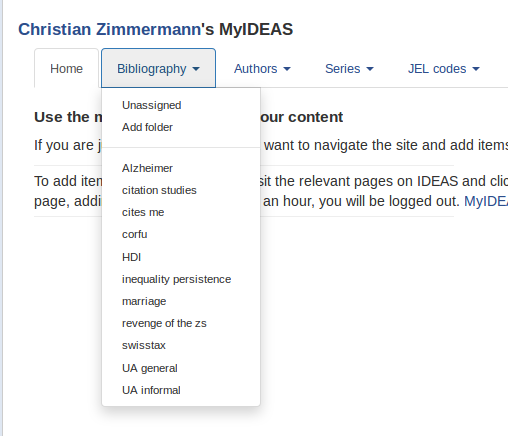 We have added a few items to the MyIDEAS account, let us see what we can do with them. Click on MyIDEAS and you get to the MyIDEAS “home”. Let us look at the bibliography. By default all additions are put in folder “unassigned”. You can create additional folders and put the items in there. Once you go into one of the folders, you can do several things with them, including sharing your folder with others, extracting all references in various formats, moving items to other folders. For the search keywords, they are no all listed on one single page because that could take a long time to load. You have to elect the keyword from the menu. Otherwise, the functionality of the page is similar. MyIDEAS is a relatively new service, so we are looking for ways to improve it. Suggestions are welcome. One that is planned is to allow for email notifications. 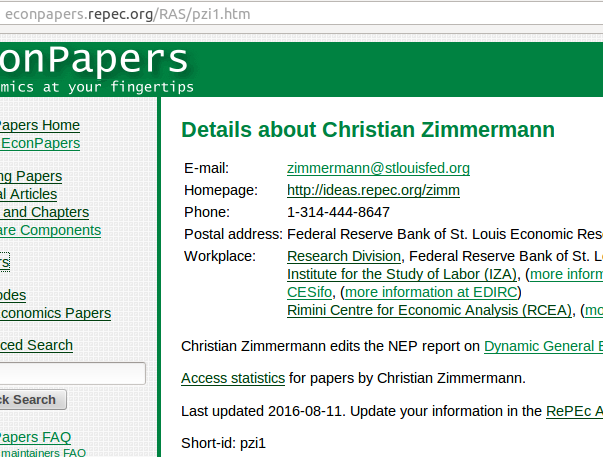 And finally, there are other ways to keep abreast of what is new in RePEc, including the NEP reports. This entry was posted on Friday, August 12th, 2016 at 3:09 pm and is filed under Bibliographic features in RePEc. You can follow any responses to this entry through the RSS 2.0 feed. You can leave a response, or trackback from your own site.